Not everything that came out in 1967 was bitten by psychedelia. I bought this copy of Scott Walker's first solo LP in the same shop in the same year that I bought “Sgt Pepper”. Scott Walker was just coming out of three years of being a scream idol with the Walker Brothers and he was determined that this time he was going to undersell himself. I fancy the picture on the back which has him looking soulfully towards the camera while a sophisticated lady gazed admiringly in his direction was originally planned to be on the front. I bet he didn’t want it, which is why they wound up with the picture they did, in which he seems to be doing everything in his power not to be a heart throb. Of course, that was something he couldn’t help. This was a big hit album. The only records that stopped it going to number one were "Sgt Pepper" and "The Sound Of Music". He still got booked on the same TV shows as Tom Jones and Cilla Black. He even had his own prime time series. This was one of those LPs you carried around under your arm, in the hope that some of its existential chic would rub off on your school blazer. Everybody has to have an image. It's often the case that the people trying hardest not to have one end up with the most powerful images of all. Scott Walker could have put a patent on "Beautiful Loser". Musically I liked it then for the same reasons I like it now. He had a voice that seemed built for Rodgers and Hammerstein as much as Burt Bacharach. He had that thundering sound that was magically cooked up in Phillips studios between Wally Stott, a rock and roll rhythm section and scores of fiddle players who probably wore braces and armbands. And there's nobody like him, before or since. Scott Walker's one of those artists, like Randy Newman, who arrived without antecedents. Now he seems to have departed without successors. I watched the whole of the first part of Leaving Neverland. Then I watched the whole of the second part. Finally I watched Oprah Winfrey’s interview with Wade Robson and Jimmy Safechuck, the two men whose recollections of their time in Michael Jackson’s retinue of pretty young boys make up the film. Before I watched it I wondered why it needed to be four hours long. Afterwards I thought the length amply justified. The film needs the time to take you through the experience of the boys as they and their parents were slowly lured into an unfamiliar world of unbelievable privilege and fathomless indulgence, as they were made to feel that they were among the Elect and their first duty was to protect the misunderstood demi-God who had put them there; as slowly, friendship turned to wooing and wooing turned to touching and then outright abuse in the many hiding places afforded by a sinister palace like Neverland. It’s a gradual process, which I gather is standard in these cases. You’d have to be either a purblind fan or in some way financially dependent on the Jackson estate not to believe these two men. The film and the Oprah interview explain why they might have given contrary testimony in the past and also makes it clear they were not paid for their participation in the film. And even if they were no amount of money could possibly compensate them for the death threats they seem to be on the receiving end of today. Was I shocked? After the supposedly clean-living River Phoenix was found dead on the pavement outside the Viper Room I stopped being shocked by the things that very famous people are capable of concealing from the public. And River Phoenix couldn’t buy anything like as much privacy and looking the other way as Michael Jackson could. I didn’t feel betrayed either. Certainly not in the way many other, younger people have been. I couldn't be betrayed because I was never devoted. I don’t believe you can ever be a fan of anybody who’s younger than you are. The only people you really look up to are the people who were already stars during your formative years. I was already an adult when the young Jackson started his career and so there’s always been a certain amount of detachment to my admiration of his gifts. One of the things that comes through in the film is that Jackson had two gears. The first was "I love everybody in the world and I want them to love me" and the other could be perfectly expressed in the sentence he uttered to one of the parents, "I always get what I want". I don't believe in the banning of music – or anything else for that matter. However I'm glad I don't have any shares in Jackson's catalogue because he and his music are about to disappear from the airwaves and streams, if not for ever then certainly for the next few years. Even the charity shops will be having to decide how they feel about selling all the copies of "Thriller" that are bound to be traded in. Is it possible to separate the man and the music? Yes, it should be. Problem is the world which made Jackson a superstar operated on the principle "love me, love my music". 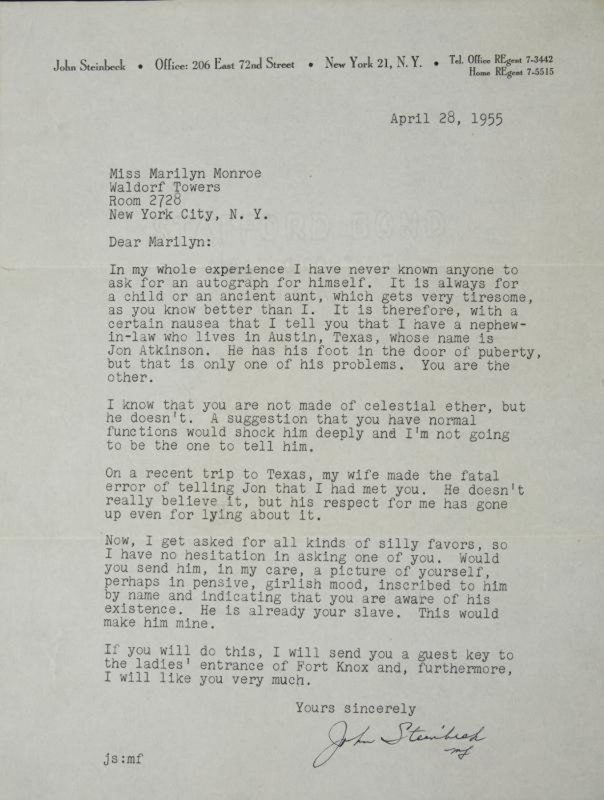 His personality was baked in to ever last note. Every video Jackson made was an advertisement for himself. It was an invitation to join in his adoration. There was no modesty in his make-up, false or otherwise. In his case people are going to find it harder than ever to separate the music from the persona and the persona from the culprit. 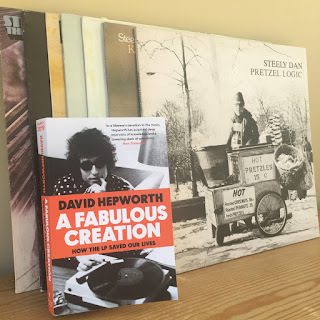 My new book "A Fabulous Creation" is all about the age of the LP, which began with "Sgt Pepper" in 1967 and finished, for a variety of reasons, with "Thriller" in 1982. Jackson set out to make "Thriller" the biggest album in history and he succeeded. Everything he did was designed to make him the biggest. Being the biggest mattered to him in a way that it doesn't matter to most stars. After watching Leaving Neverland we can only conclude that the biggest star in pop has also turned out to be its biggest creep. 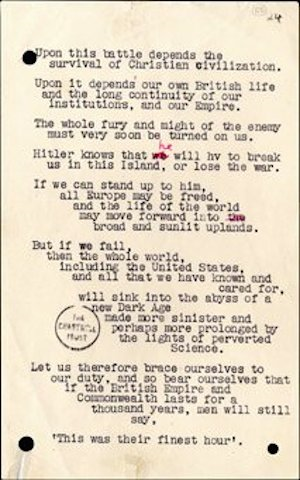 He believed what Goebbels believed – that if you're going to tell a lie, you may as well tell a big one. A lot of people believed it. Some still do. You have to wonder if they really do in their heart of hearts. As the producer of the film says to Oprah Winfrey, "all these people rushing to his defence – how could they possibly know what went on behind closed doors?" Fandom's a kind of madness. All too easily it spills over from liking somebody's music and the way they do their hair into a blind belief that everything they do is beyond question. To some extent idols have always let us down. But in the past they've let us down gently. That's not the case here. After Leaving Neverland I find myself wondering. Have we adored our last pop star? One of the most striking revelations in Andrew Roberts book about Churchill is how much work he put into every single piece of communication he authored. He had a prodigious memory, which meant he could call upon every poem, Bible reading or Shakespearean speech he had ever heard, and he was almost incapable of writing an inelegant sentence. But that didn’t mean he would wing it. 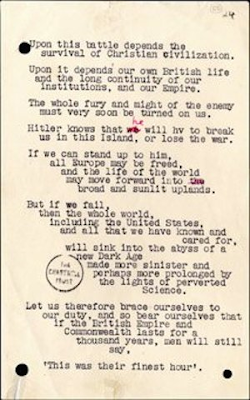 Churchill would dictate his speeches, then correct them on the page and then dictate them again. The final version he read from would always be rendered in “psalm form” with the short lines indented so that he could read each one before saying it and then easily see where his eye should go next. That’s how he became the greatest orator of the twentieth century - by starting off with a God-given talent and then working at it four times as hard as anybody else would. 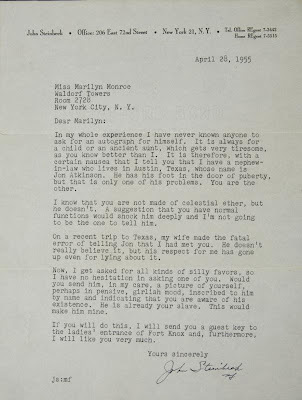 I was thinking of him yesterday when I saw this letter which John Steinbeck wrote to Marilyn Monroe. It’s just a simple request for an autograph but it’s better written than most novels. I bet he did it ten times before he got a version he was happy with. That’s the difference between the greats and everybody else. The infinite capacity for taking pains. When Will Birch tweeted this the other day I couldn't help but agree with his choice of Steely Dan. They’re the act I just naturally reach for and not just to test audio. They’re my default position in all kinds of situations. I’ve just been looking at the covers of the first seven LPs. (After that it’s all CDs and compilations and you can’t really feel the same about CDs and compilations.) Because the covers of those records didn’t feature pictures of the band, all had cryptic titles and didn’t appear to share any particular aesthetic they seemed the perfect thing to reach for when you weren’t sure how you felt or what you felt like. The act of “reaching for” something is qualitatively different from the act of clicking a couple of times and having it there. It’s an act that takes place in the physical world and therefore calls for commitment. In its own tiny way it echoes the difference between a teenager going up to someone and asking them out and merely friending them on Facebook. I’ve spent a lot of the last year thinking about LPs and their covers for my upcoming book A Fabulous Creation. The cover was always more than the wrapper for the thing itself. Because it was twelve inches square and you couldn’t just slip it into your pocket it projected the music into the physical world. Therefore your decisions about what to play next were made as much visually as anything else. The problem with taking all those precious physical objects and reducing them to noughts and ones is that once something is out of sight it has a tendency to be out of mind as well. Blurbs on the covers of real-life stories of espionage that invoke the name of John Le Carré too often seem like a devalued currency. They’re like those reviews of new Stones albums that say “their best since ‘Exile On Main Street’. 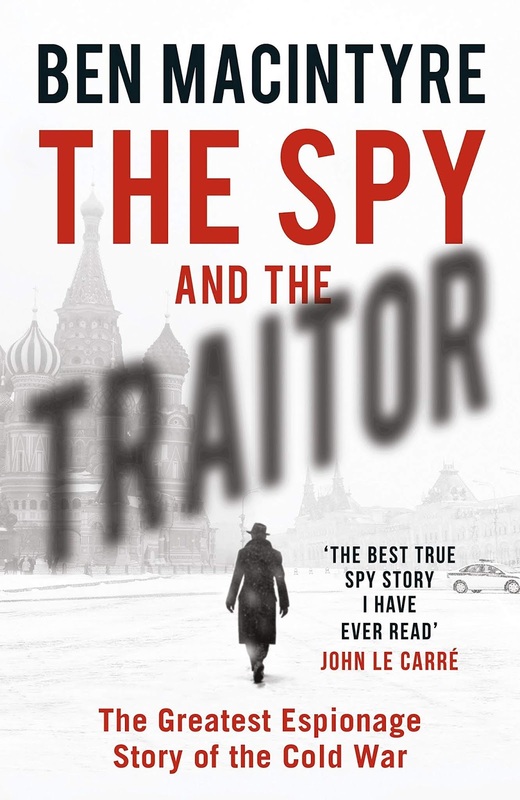 However I can assure you that The Spy and The Traitor, Ben Macintyre’s book about Oleg Gordievsky, fully warrants that kind of billing and that's for two reasons. The first is that Gordievsky is, as spies go, noble. He didn’t do it for money. He did it because he believed it would make the world a safer place. The second is that Macintyre is a brilliant storyteller who knows how to leave out the kind of detail that drags on the narrative and understands the importance of key details much as a spy would. For instance, when Gordievsky was working for HM Government while based in Russia it was agreed that if he wanted to talk to his handlers he would stand outside a certain bakery at a certain time of the week carrying a Safeway bag. That meant staff from the embassy had to check in at this place scores of times, always wearing the same coloured clothes, holding the same carrier bags and having about their person a Kit-Kat and a Mars bar. Just in case. 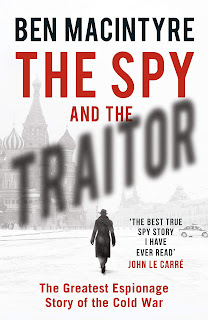 When Gordievsky was transferred to London his handlers kept on checking in at the same place in case the KGB had been watching and would connect the British spies’ non-appearance with Gordievsky’s absence from Moscow. Handling that one agent, whose identity was known only to a handful of officers, involved hundreds of people in years of harmless charades and a small minority in acts of breathtaking courage, particularly when it came to the moment of his "exfiltration". The team set off from Moscow by car on the pretext of going to see a doctor in Finland. They take with them all the supplies they would need to stage a full picnic, English middle-class style, as well as syringes full of sedatives to quell the nerves of anyone called upon to spend a long time in the car's boot. Unbelievably the team also includes a husband and wife who, partly because they can't find a sitter and partly because her presence would serve to confuse their KGB shadows, take along their baby girl. 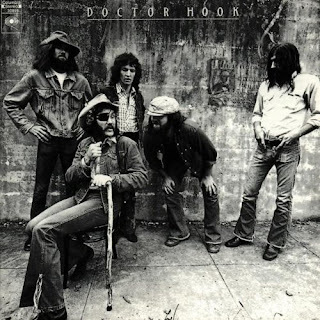 Furthermore, this being the mid-80s, to pass time on the journey, they take cassettes including Dire Straits' "Brothers In Arms" and the Greatest Hits of Doctor Hook. Macintyre makes almost comic use of this last choice in the narrative. I'm sure if they make this into a movie the director will have a field day.